Special Containment Procedures: SCP-2805 is to be contained within a cryonic containment unit located within Site-77. No personnel are permitted to directly view SCP-2805, and must do all observation through closed circuit cameras. Any Foundation employees who have worked on or around SCP-2805 and subsequently leave employment of the Foundation are to be monitored. Any former personnel who worked with SCP-2805 are to be prevented from taking up employment with The Walt Disney Company. 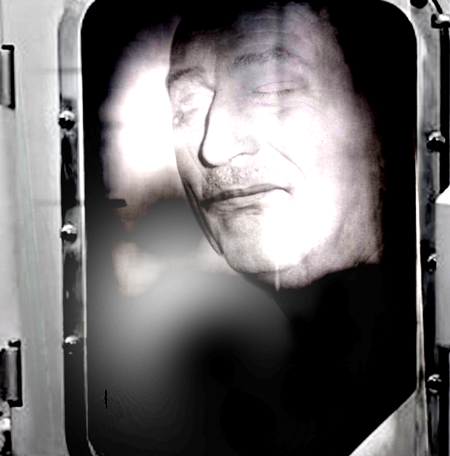 Description: SCP-2805 is the severed head of American industrialist Walt Disney, held in suspended animation within a cryonic freezer. Attached to the freezer are two rotary telephones, circa 1966. Analysis of the cryonic device has been hampered by the fragility of the device and the effect SCP-2805 has on personnel who speak to it. On the base of the cryonic device, the words "Siberian Solutions from the Oneiroi Collective"1 have been embossed. When a human subject is able to physically view SCP-2805, they will receive a phone call within 24 hours.2 The individual making the call claims to be Walt Disney, who will talk to the subject at length about their hopes for the future, their desires, and the "Epcot" portion of the Walt Disney World amusement park. Digital analysis has confirmed that the voice on the other end of the line sounds identical to recordings of Walt Disney's voice circa 1965. Phone calls were traced to various locations owned by the Disney corporation. Occasionally, during these calls, unidentified individuals can be heard demanding to be allowed to speak to the subject. SCP-2805 will usually ignore them, but on occasion it has asked the subject to wait. During these times, a sound described by subjects as "frozen insects hitting glass" can be heard, before SCP-2805 resumes conversation, apologizing for delays from "unimaginative souls". SCP-2805 was discovered on 09/18/1967, when several secretaries for executives within the Disney corporation reported hearing calls from SCP-2805. After an executive member of the board of directors was called, he began to spend significant amounts of time with the original "Epcot" plans, and eventually began to petition strongly for fashioning the "Epcot" park as an industrial center, similar to how Walt Disney had designed it. Foundation personnel intervened once the phenomenon was recognized as legitimate, and SCP-2805 was discovered within a hid[REDACTED]ribbean. It was contained on 02/16/1968, and classified as Euclid. On 04/25/1968, SCP-2805 began calling Foundation personnel. Foreword: SCP-2805 called Agent Smith while the latter was involved in interviewing SCP-███. Familiar with SCP-2805's documentation, Agent Smith carried out an impromptu interview with SCP-2805. SCP-2805: Hello? Am I coming through? Agent Smith: Yes, can I, uh, ask who this is? SCP-2805: My name is Walt. I'm terribly sorry for calling without any forewarning, is this a bad time? Agent Smith: No, no, uh, please (sound of papers shuffling) please continue. SCP-2805: Well, if you've got the time, I'd like to talk to you about a project I've had in the works. Agent Smith: I've got all the time in the world, sir. SCP-2805: I call it the, uh, Florida Project. It's an experimental prototype for a future community. It's a place where the modern, hectic world wouldn't be a bother. A place where future technologies could be deployed, and then to the world. Unfortunately, I left my plans in the hands of people who didn't share my vision. SCP-2805: Marty. I hired him to work the newspaper, and after my, uh, illness, which I shall not go into, he was placed in charge of the Florida project. That's what I called it. But, they couldn't do it. All my imagineers, brilliant men, but they couldn't do it. Agent Smith: Couldn't do what, exactly? SCP-2805: The vision. None of them grasped it. I had thought, with the film, it was very explicit, but it didn't come across to them. I wanted a community of tomorrow, but they gave me a world's fair. Sklar, Marty, he was a wonderful boy, but he got it wrong. Agent Smith: I'm, uh, sorry to hear that. Is there anything I can do for you? SCP-2805: Marty couldn't do it, but he's not my only recourse. Other people can. Maybe even you. SCP-2805: I had a great vision, for a place to save the modern world from congestion, and horrible crowded noisiness. I want a place my grandchildren can grow up in. Do you see what I mean? Agent Smith Yes… but I, uh, don't think you're coming to the right guy. SCP-2805: Oh, but I am! Agent Smith: How do you figure? SCP-2805: Your organization, sir. I can't say with honesty that I understand everything you do, but you've got quite a bit of pull, and you're certainly a mile ahead of the technology sector. You can do it. SCP-2805: I need you to help me. I have a delivery system for my message, built on the backs of unimaginative dreams and parasites. I'm using them, so that we can build a better tomorrow. Can you dream it? Agent Smith: I… don't know. SCP-2805: If you can dream it, you can do it.